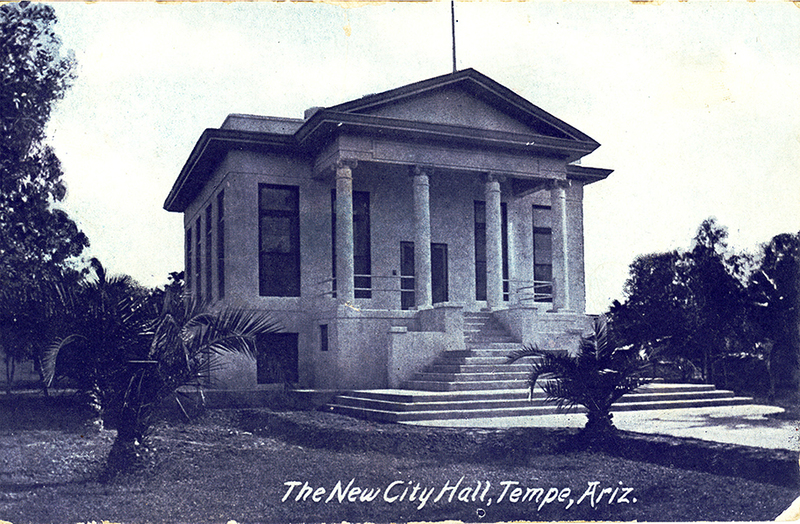 Tempe’s first City Hall has it appeared shortly after its completion in 1914. After more than 35 years the only City Hall that most Tempe residents identify with is the curious “upside down” pyramid on East 5th Street in downtown. Few recall or know about the first City Hall on the same site. Tempe began in 1871 as a ferry crossing of the often tempestuous Salt River. By 1894, the town had grown to a sufficient size that it was time to incorporate. For the next two decades, the town council conducted their business in various buildings around town including the Andre Building (now home to Rula Bula) and the Tempe Hardware Building. In 1912 the year of Arizona’s statehood, Tempe was the state’s sixteenth largest city. About 1500 people lived in an incorporated area of less than two square miles ─ but a size substantial enough to warrant an official City Hall. But who should design it? Enter Leighton Green Knipe (1878-1941). Knipe found his way to Arizona about 1909 from his home state of Pennsylvania. Trained as an engineer it didn’t take him long to find work in the burgeoning Salt River Valley. According to recent research by Ted Siefer, Knipe was making his living as an engineer, “but…clearly had architectural ambitions.” That opportunity came in 1911. While doing some engineering work for the town’s sewage system, Knipe learned about plans for the Tempe National Bank at the northeast corner of Sixth and Mill. His distinctive design for a stark-white, Egyptian Revival building was exactly what the bank’s board of directors was looking for. Knipe’s work on the Tempe National Bank caught the attention of Tempe’s city fathers who commissioned him to design a City Hall and jail. Siefer says that Knipe’s “textbook neoclassical style with Greek columns and pediment” design won out over more established architects James Creighton and Royal Lescher. When it was dedicated in 1914, Tempe’s City Hall was as imposing as any other in the Valley. The entrance framed by four tall columns was only reached after scaling 14 steep pyramid-like steps. Over the next two decades Tempe’s population had doubled to nearly 3000. The town’s bureaucracy had also increased requiring more room at City Hall. Sometime in the 1930’s red tile roofed, Spanish revival architecture wings were appended to the east and west sides of the original building. The ground-level additions were a distinct contrast to the main building’s Classic design. 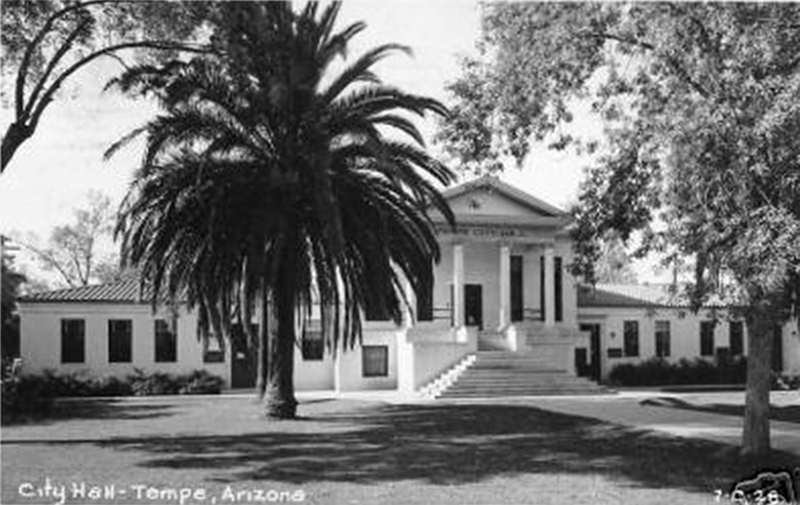 The east side served as the home to Tempe’s public library from 1941 until 1957. Following his two successful projects in Tempe, Knipe’s career soared. He went on to design several buildings on the Tempe Normal School campus. Knipe is also credited with laying out the company town of Litchfield Park in 1918. Named for Paul Litchfield, vice-president and factory manager of the Goodyear Tire and Rubber Company, the town was created to support cotton growing in the area. Cotton was an essential component of tire manufacturing. Knipe then moved on to California where he received commissions for the design of several important ranch homes. He is considered one of California’s most influential architects of the 1920’s. Knipe died in 1941 in Marfa, Texas while possibly working on a project there. He is buried in Chatsworth, California. And to think the career of a great architect got its start right here in Tempe. If you have any recollections of the original City Hall why not share them with other Tempe Republic readers at ???? So why did Tempe’s wonderful old City Hall disappear? That’s for next time. An expanded City Hall with its east and west wings.